It was another packed week in the academy this week with games played across all 3 ages levels and the squads being used to their fullest as the needs of the first team plus international commitments restrict selections. The week started off with the U18's who have had a very good start to season and are currently sitting on the top of the Southern section of the U18's league despite suffering defeat to the hands of Brighton this week. It was a young team put out with the U21's playing the same day and players being involved with the first team squad again for the same day. It meant that the team on the day was Jared Thompson, Josh Grant, Jake Clarke-Salter, Mukhtar Ali, Cole DaSilva, Ruben Sammut, Isaac Christie-Davies, Kyle Scott, Charlie Wakefield, Miro Muheim and Ike Ugbo with the subs as Trevoh Chalobah, Mason Mount, Jacob Maddox and Nathan Baxter. The game finished in a 2 - 1 away defeat for the Chelsea boys and they went behind a third of the way through the game when the Brighton forward forced his way into the box and was able to have a chance at a free shot at Thompson and he made no mistake by slotting home. In the second half Chelsea were level after a terrific driving run from Isaac Christie-Davies and a neat one two with Ugbo saw Christie-Davies hit a great shot past the keeper and bring the blues back into the game. However Chelsea even though they tried to push for a winner could not get it and ended up conceding instead through a wonderful curling shot from the edge of the box which gave Thompson no chance. It was disappointing to lose that game but with all the changes to the team and with Brighton just below Chelsea in the table (now just one point behind) it was always going to be a tough game. 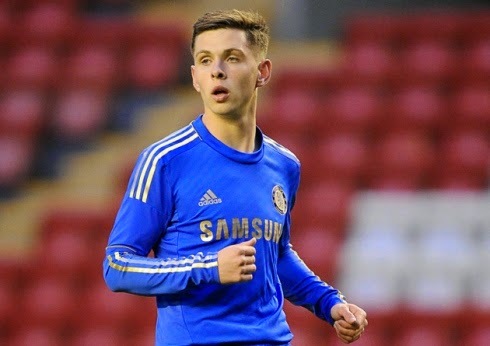 The U21's were also playing on Saturday and they had a home game against Fulham which was shown live on Chelsea TV. The game finished in a draw in a game that Chelsea dominated and should have put to bed a lot sooner and it costed them that they did not. The team was Mitchell Beeney, Todd Kane, Alex Davey, Andreas Christensen, Jay DaSilva, Jordan Houghton, Ruben Loftus-Cheek, Charlie Musonda, Jeremie Boga, Charlie Colkett and Isaiah Brown. The sub bench was Alex Kiwomya, Ola Aina, Kasey Palmer, Billy Granger and Fankaty Dabo. Chelsea started the game very well and were in complete control and took the lead when Loftus-Cheek picked up the ball and drove forward unleashing a shot from outside the box that cannoned off the bar and down, could very well have gone in too, and bounced out to Brown who seeing the keeper darting across to make the save headed across him and giving him no chance and giving Chelsea the lead. Chelsea were in control and should have done more to create and score more goals but Fulham would have their chances, none more than following a goalmouth scramble and the ball falling to a Fulham player 3 yards out who slashed horribly at it and the ball went wide. Jeremie Boga and Charlie Musonda were the ones causing most of the problems however it was DaSilva's work that lead to Chelsea's second in the second half. A cross/shot across the face of the goal by DaSilva was only parried by the Fulham keeper and it bounced up and towards the penalty spot and the only person to follow up for either side was Jordan Houghton who tucked the ball home and gave Chelsea a deserved 2 - 0 lead. It seemed that would be all Chelsea needed to secure the win but it would not be long before Fulham got one back, a quick break down the right hand side and a deadly ball low and hard across the box found a Fulham forward with just Beeney to beat and at point blank range Beeney blocked the shot but the ball rebounded straight into the path of a Fulham player who slotted home and Chelsea something to think about. Chelsea would create chances but not really any that could be classed as clear cut and they would be punished for not closing the game out. Again a break down the right hand side saw a cross cleared out to just outside the box and watching the ball all the way the Fulham goalscorer hit the ball on the volley really well and accurately giving Beeney no chance and brought the game level. It was a big blow and Chelsea should have seen the game out but Fulham are a good side and the draw leaves Chelsea still joint top of the table with Manchester City. Finally and the U19's had their third UEFA Youth League game at home to Maribor on Wednesday and were looking to continue their 100% record in the group stage as they managed last season. It was to be a game played in very difficult conditions with the wind being a massive factor in the game and meant that Chelsea were only able to come away with a 2 - 0 win despite being far superior to their opponents. Chelsea's team was once again without Dom Solanke who was with the first and would make his debut against senior opposition in the Champions League and lined up with Jared Thompson, Ruben Sammut, Andreas Christensen, Jake Clarke-Salter, Ola Aina, Ruben Loftus-Cheek, Charlie Colkett, Alex Kiwomya, Charlie Musonda, Jeremie Boga and Izzy Brown with the subs as Charlie Wakefield, Kasey Palmer, Ike Ugbo, Nathan Baxter, Isaac Christie-Davies, Kyle Scott and Mukhtar Ali. It wouldn't take long for Chelsea to open the scoring and once again it was that young man Jeremie Boga causing mayhem, running from just inside the opposition half he jinked past a couple of players, played a one-two with Brown rode the challenge of another couple of players and hit a shot well past the keeper. It was a great start and Chelsea would continue to monopolise possession of the ball and have all the real chances. There was a big chance for Colkett when good work for Loftus-Cheek saw him drive into the box and cut the ball back and all Colkett had to do was get the ball on target under no challenge, however unfortunately for Charlie the ball fell on his right foot which is far from being his most comfortable and he scuffed the shot wide. Substitute Charlie Wakefield was the next to try his luck having a shot from a tight angle which may have been better to cut back and was a relatively easy save for the Maribor keeper. Charlie Musonda had a decent free kick which was just at the right height for the keeper to make a fairly comfortable save but then Chelsea did eventually make it 2 - 0 when Boga once again linking up with Brown hit a shot low and hard again but this time for further out which the keeper could not get to although he probably should and Chelsea had doubled their lead. The second half was a frustrating one where the game became very bitty and scrappy and manage Viveash was getting frustrated with his players not being to put anything together and losing the ball far too easily. The best chances fell to Jeremie Boga who was close to his third when he hit another long range effort just over the bar and finally when he did get another chance again from distance he hit the bar with a great effort and was unlucky to not come away with the match ball. As a game it was not a classic and much like the U21's game against Fulham the young Chelsea team should have done more, however Maribor did not put up much of a threat at all and Chelsea were able to walk away easy winners on the day.